Give kids an entire galaxy to explore with this fun, foldable play set by designer dad Luis Albarrán. Space Patrol to Cardboard Command: We've encountered friendly aliens! They want to know where mom found this awesome outer space play house. Dad and designer Luis Albarrán noticed something universal about kids: They love to play with boxes big enough to explore the galaxy. So he created this play set to take little astronauts' imaginations to the next level. Unfold and assemble the planetary lander in minutes without sonic screwdrivers or any special tools. Kids will quickly befriend the accompanied aliens and blast off for the Fun Nebula in the wearable space gear. And the best news of all for earthlings: Everything is made from 80% recycled (and 100% recyclable) materials to reduce the accumulation of space junk. 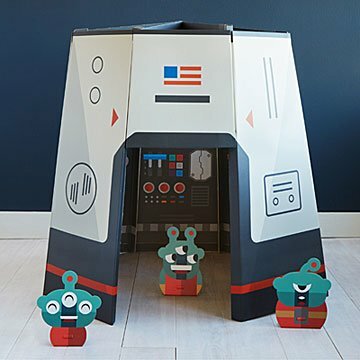 The playhouse and accessories are water resistant and can be customized with washable markers, but shouldn't be left outdoors on rainy planets. When the mission's complete, the foldable design breaks down in seconds to store in your favorite space station. Made in Mexico. It comes with so many accessories there are endless possibilities and new story lines each time you use it. Such a fun and simple gift! This was such a fun gift! My Husband and I purchased this for our 2 year old nephew because it was a unique but simple play area that would be super appropriate for his age. He absolutely loved it and spends a lot of time in his new "fort". According to my brother-in-law it was very easy to put together. Only downside is I do think the price tag is high for an essentially cardboard product, but just seeing how much fun our nephew is having makes the price worth it!